Musa acuminata is one of the best fruits that is very rich in potassium. This extremely versatile plant is widely grown since it produces several bunches of edible fruits all year long, especially in the tropical regions of the world. We enjoy relishing its sweet fruits quite regularly. Botanical Name: Musa acuminata (syn. : Musa balbisiana, Musa sumatrana). 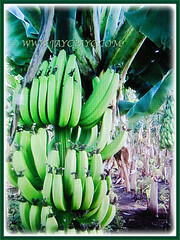 Common Names: Dwarf Cavendish Banana, Ornamental Banana, Pisang Serendah in Malay. Etymology: The genus Musa is named in honour of Antonius Musa, physician to the Emperor Augustus. Origin: Native to Southeast Asia, southern China, Madagascar and Africa. It widely cultivated elsewhere around the globe. Plant type: A tropical, herbaceous and perennial plant. Features: Musa acuminata is from the genus, Musa that consists of about 70 species of flowering plants. Musa acuminata is a relatively fast-growing and upright herbaceous plant that sprout from underground rhizomes. It can grow between 5-7 m in height. The plant is normally tall and fairly sturdy with a trunk known as a pseudostem. The base of the petiole widens to form a sheath and the tightly packed sheaths make up the pseudostem which supports the plant. 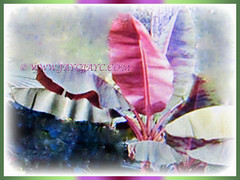 The flexible, waterproof, evergreen, simple and smooth leaves are arranged spirally. The enormous leaves are up to 2.7 metres in length and 60 cm wide. They are attached to the fleshy trunks by short petioles. Some cultivars have foliage that is splotched with red patches above and is glossy burgundy red on the underside. 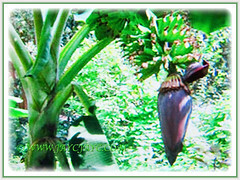 When a banana plant is mature, the corm stops producing new leaves and begins to form an inflorescence. A stem develops which grows up inside the pseudostem, carrying the immature inflorescence until it emerges at the top. Each pseudostem normally produces a single inflorescence. After fruiting, the pseudostem dies but offshoots or suckers will normally have developed from the base. The inflorescence contains many bracts between rows of flowers. The female flowers which develop into fruits appear in rows further up the stem from the rows of male flowers that are borne at the tip of the inflorescence. 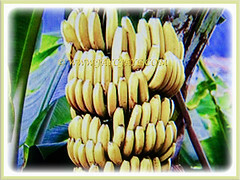 The banana fruits develop in a large bunch of hanging clusters from the top of the plant and is made up of 3-20 tiers with about 20 fruits to a tier. Each fruit has a protective outer layer known as the peel with numerous long and thin strings which run lengthwise between the skin and the edible inner portion. The fruit is variable in size, color and firmness. It is usually elongated and curved with soft flesh rich in starch and covered with a rind which may be green, yellow, red, purple or brown when ripe. 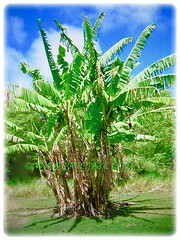 Culture (Care): Musa acuminata or Ornamental Banana can be easily grown with least maintenance. Moisture: Moderate to high water requirements. It should be constantly moist but not saturated. Soil: Humus-enriched, loamy and well-drained soils. However, it can grow on a range of different soil types including sandy, loamy and clay soils. Others: Prune of shredded leaves from the banana plant to keep it tidy and aesthetically pleasing. 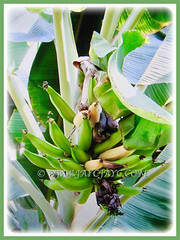 After you have harvested the fruits, cut down to about 0.5 m, the pseudostem of the banana tree to to make room for the new suckers that grow up around its base. 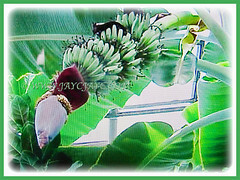 Provide sufficient space for growing a healthy banana plant. Protect it from strong winds that may topple the plant. Since bananas grow rapidly, they should be fertilised once monthly with a high nitrogen fertiliser. Generally free from serious pests and diseases. However, do watch out for aphid, fruit caterpillar, rust thrips, banana weevil borer. For subtropical and temperate regions: Hardiness: USDA Zone 8-11. Musa acuminata grows well in warm, humid tropical and subtropical climates. 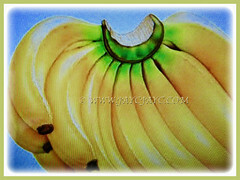 Dwarf Cavendish Banana is among the most cold hardy of the edible varieties. 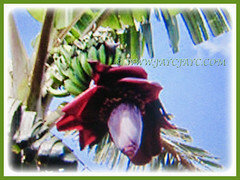 Bananas require 10-15 months of frost free weather to produce a flower stalk and another 4-8 months to ripen fruit. Temperatures below freezing will kill the foliage to the ground. The rhizomes, hardy to -5.5°C or lower will send up new shoots when the weather warms again. Plant it near a pond or garden pool where it will have constant access to water. Protect it from strong winds that may topple the plant. During the growing season, feed it with a high nitrogen fertiliser once monthly. Propagation: Easily propagated by dividing the suckers that emerge readily from the base of the mother plant. Usage: Musa acuminata or Dwarf Cavendish Banana with its bunches of edible fruits and ornamental beauty will be excellent when grown on the ground. A dramatic and tropical looking plant that is ideal for container gardening. The cultivated banana is an important crop in the tropics and subtropics, providing energy and nutrient rich food for millions of people throughout the world. It is a staple crop providing food from the fruits, buds and leaves, for building materials, shelter, used as plates and wrappings for storing food. The fruit can be simply peeled and eaten or sliced and served in salads, cakes, custards and ice-cream. In Africa, ripe bananas are fermented into beer and wine. 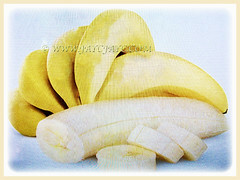 The peel of dried banana has a high tannin content and is used to blacken leather. The flowers are used to treat bronchitis and diabetes, the young leaves are used as poultices on burn, the roots are used for digestive problems and the peel and pulp of ripe bananas are found to have anti-fungal and antibiotic properties.